In 1999, a grassroots campaign called the Loomis Forest Fund succeeded in doing what few thought possible. In a mere 12 months, our coalition effort grew to 70 organizations and businesses. Marshaled by Conservation Northwest, this partnership raised $16.5 million from private individuals and foundations to permanently protect 25,000 acres of the Loomis State Forest from logging—saving critical habitat for endangered Canada lynx and other wildlife. Not only did this campaign preserve important habitat and outdoor recreation areas, but it also bolstered education. The bulk of the forest acres protected were state trust lands, and the money raised was paid into the trust fund for schools. The funds raised by our campaign fulfilled trust obligations while permanently protecting this unique and critical state forest as the Loomis Natural Resources Conservation Area (which is now managed in two blocks, North and South), ensuring it will continue to provide vital wildlife habitat and excellent outdoor recreation opportunities for future generations. The Loomis State Forest and Loomis Natural Resources Conservation Area is located in north-central Washington, west of the town of Loomis and adjacent to the Pasayten Wilderness Area. Today, the Loomis State Forest is split into two parcels and preserved as state natural resource conservation areas. Loomis North adjoins the Pasayten Wilderness Area to the west and Canada to the north. Loomis South contains the Upper Sinlahekin River drainage. Managed by the Washington State Department of Natural Resources and open for hiking, wildlife watching, hunting, mountain biking and other recreational uses, today, both conservation areas are protected from roadbuilding and logging. While the critical core of the Loomis is now protected, nearby areas of the Loomis State Forest remain open for multiple uses, including trust-land timber harvest. In the Loomis, mid-elevation, fire-adapted forests of lodgepole pine and higher elevation stands of spruce and fir provide particularly rich habitat for the threatened Canada lynx and for snowshoe hares, their main food source. The Loomis is such prime habitat that a third to one-half of the approximately 100 remaining lynx in Washington are thought to live there. Supporters of the Loomis Forest Fund gave a most generous gift to Washington state residents, children, and wildlife. All who helped make this effort a success deserve many thanks. Protecting the Loomis Forest was a success for wildlands, wildlife and the schools, wrought by the imagination, forethought and generosity of all who were part of it. 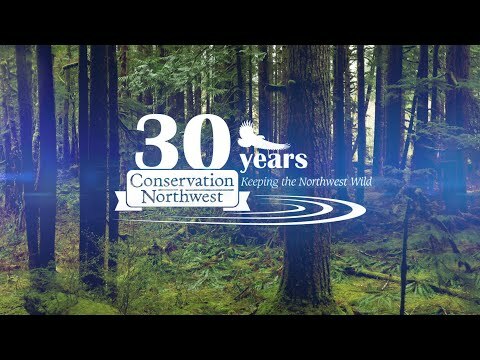 In 1998, the Loomis Forest Fund, a coalition effort spearheaded by Conservation Northwest (then called Northwest Ecosystem Alliance) set out to raise $13.1 million to compensate school trusts for the fair market value of these lands. The goal was to permanently protect this forest and the vital Canada lynx habitat it contained from logging. The opportunity was the result of a landmark agreement with the state of Washington: settling lawsuits over the management of 25,000 mostly-roadless acres in the Loomis State Forest. Conservationists had one year, until July 1, 1999, to raise the funds to pay fair market value of the standing timber to the school trusts and protect the forest. The Loomis Forest isn’t just home to lynx. Mule deer, moose, occasional wolves, grizzly bears and a range of other species call this place home, too. Photo: Steve Krull. In the summer of 1999 things were going well. The Loomis Forest Fund had raised most of the money through small to large donations from about 3,500 people. But in the last few breathless weeks of the campaign, a second assessment of the timber value of the forest came back $3.4 million higher than the original assessment. In the nick of time, the late philanthropist Paul Allen contributed the entire extra amount, clinching the deal. The closing price went directly into the school trust fund to benefit education. On January 4, 2000, the Board of Natural Resources unanimously approved the final quitclaim deed to transfer ownership of the Loomis wildlands from school trust to natural resource conservation area status, and, as such, they are now managed to benefit all the people of Washington and the wildlife who call this special place home.